As one of the support units for the police force, the Emergency Response Team are there to respond to high priority calls throughout the city of Belleville. Trained to deal with barricaded persons, the 13 members of the ERT work alongside negotiators to carry out warrants involving drugs and weaponry. 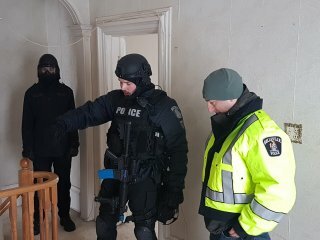 While drug or gun warrants are a high priority in Belleville, the team are also responsible for missing person searches and have been trained on using special GPS methods, such as grid searches. The ERT respond to an average of 25 to 40 calls per year, as part of their training, they dedicate 20 days a year to train in stressful situations and different scenarios they can encounter during the job. To qualify for the team, candidates must go through a task specific fitness test which will test their capabilities when responding to a call, this includes scaling six-foot walls, carrying the heaviest person on the team and many other physical tests. This is all done with a mask that restricts breathing. If you can’t pass this test, you will have difficulties on the Emergency Response Team. Sgt. Martin Charbonneau, who has been on the response team for 11 years, says building the confidence to trust that his comrades will react the correct way takes time.